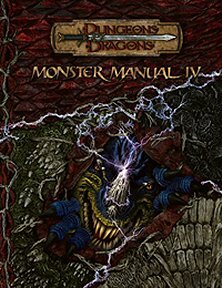 Publisher's blurb: "Monster Manual IV is the most recent volume in the bestselling Monster Manual line. Sure to be popular with both Dungeon Masters and players, this supplement to the D&D game provides descriptions for a vast array of new creatures. Each monster is illustrated and features a new stat block format that facilitates faster gameplay. In addition, the book includes sample encounters, pregenerated treasure hoards, and sidebars on how to incorporate the creatures in a Forgotten Realms or Eberron campaign."